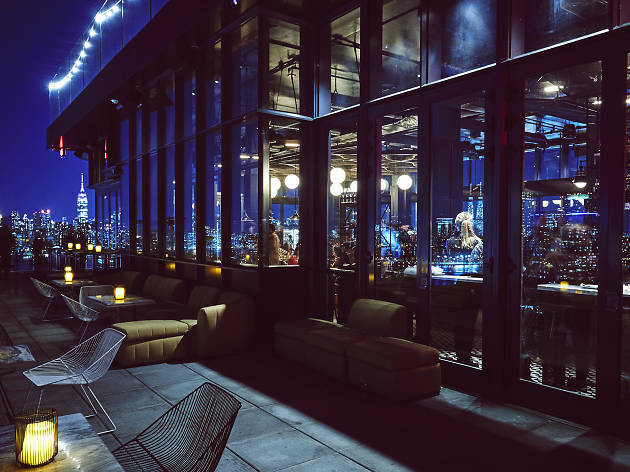 One of the greatest perks of Gotham living is the plethora of towering rooftop bars in NYC from which to soak up sweeping views alongside boozy sips. 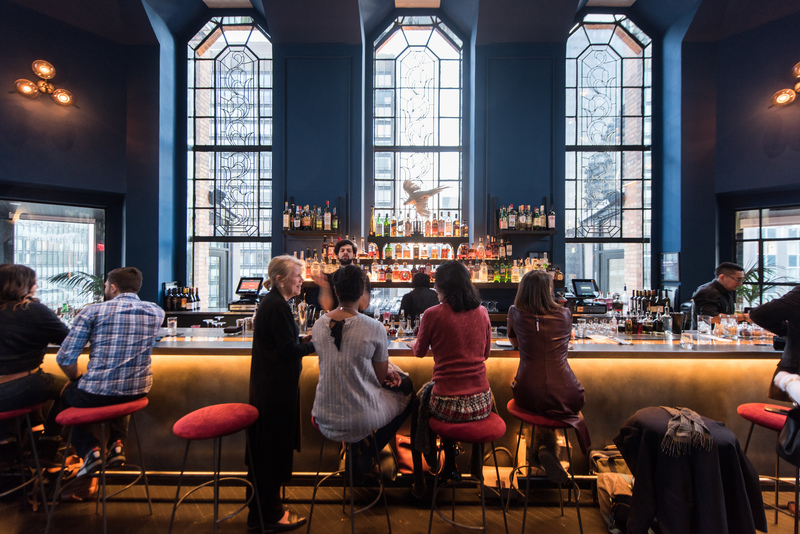 While the sunshine and rooftop pools only appear during warmer months, there's no shortage of elevated digs for wintertime boozing and more of the best things to do in winter. 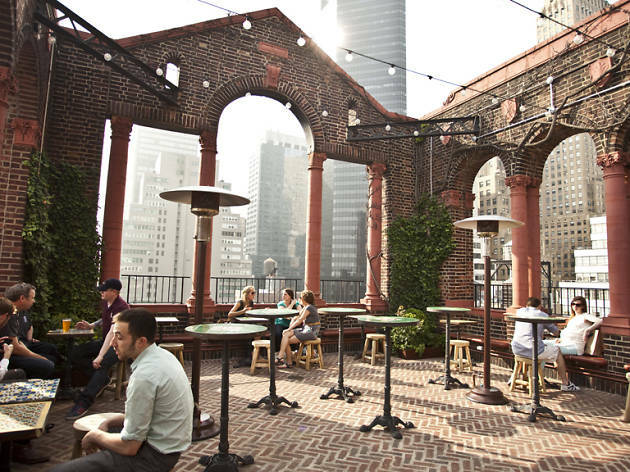 From a secret log cabin to a no-frills rock club, here are the best NYC rooftop bars open during the winter. 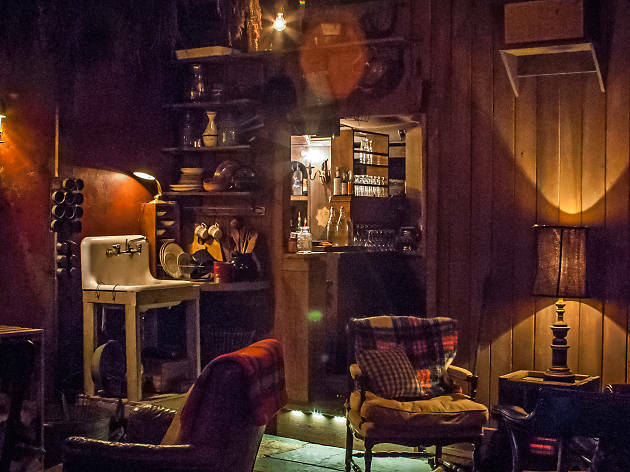 During the colder months, a cabin-themed watering hole temporarily taks over the rooftop of the McKittrick Hotel. 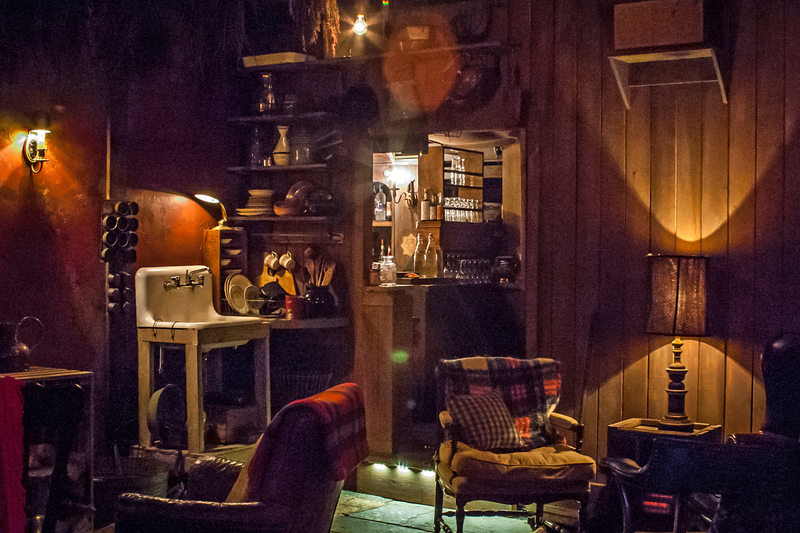 The bar is designed to resemble a cozy alpine retreat and offers the same level of detail as the set of Sleep No More. 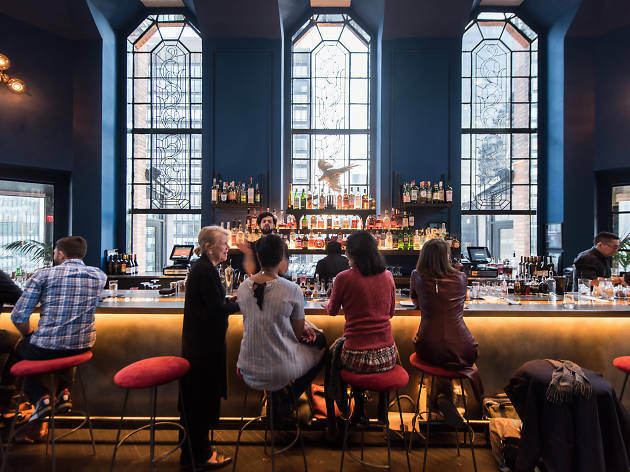 Though there are plenty of cozy bars in the city, the Lodge takes its theme to a new level—Visitors can snuggle on bunk beds or sit at a desk covered in pinecones and rolled parchment. A stylish glass box capping Williamsburg's tallest skyscraper. 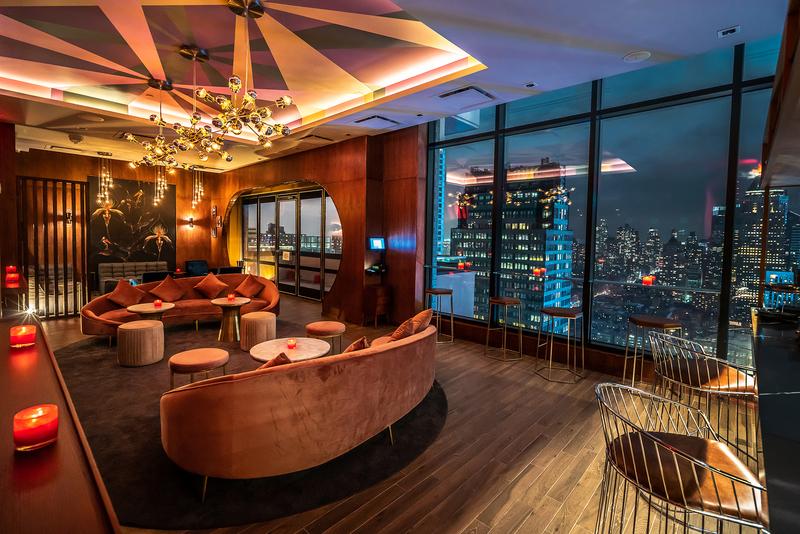 Take the dedicated elevator 22 stories up to the industrial yet swank space—set with black-and-white tiled floors, bright globe lights and a beamed ceiling—to experience a hotel rooftop bar that has all the goods to be a standalone New York cocktail den. 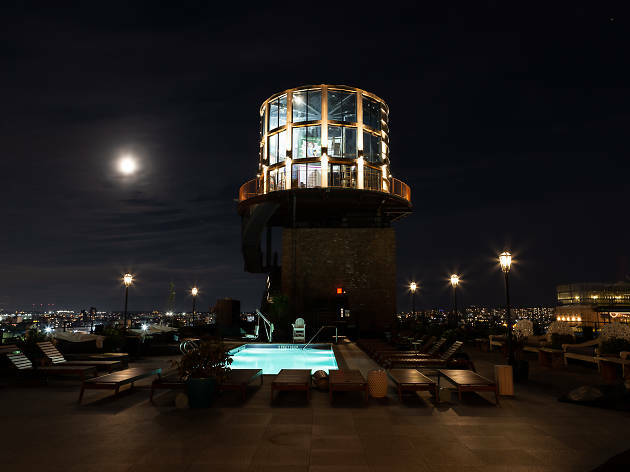 This Williamsburg Hotel cocktail bar is set in its sky-high "water tower." Aptly titled, The Water Tower, the cylindrical structure sits above the hotel's outdoor pool, with view of Williamsburg, the East River and Manhattan from the steel-encased, floor-to-ceiling windows. The inside is decked out with velvet couches and chaises and the back wall is covered in murals painted by local artists. On weekend nights, the space will turn into a nightclub soundtracked by international DJs. 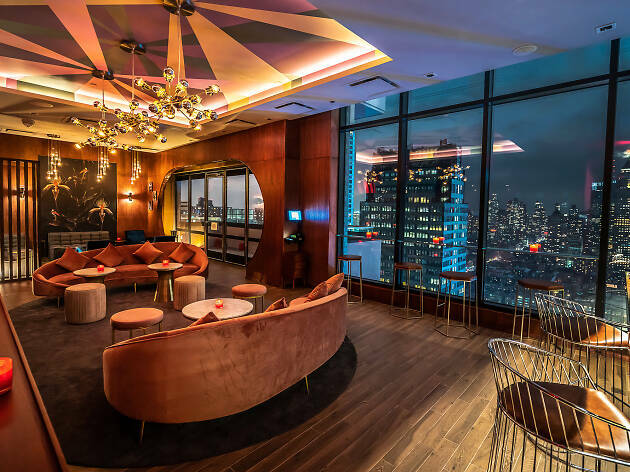 While the Crown exudes its share of pomposity (especially on weekends), its welcoming demeanor and soaring bird’s-eye view makes it worth the hype. 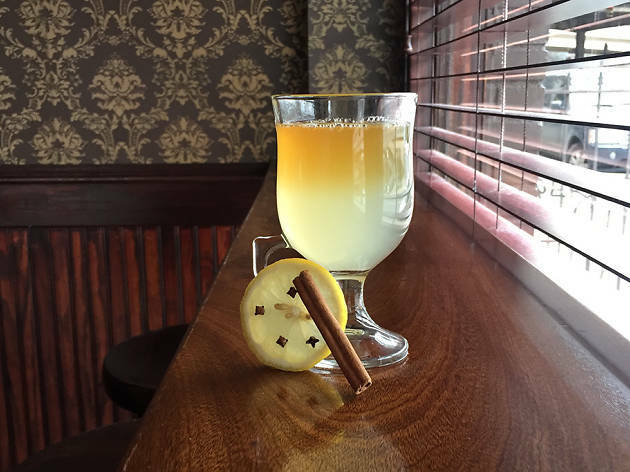 The Asian-influenced cocktails look beautiful. Full stop. The mythically named, vodka-based Black Dragon Tea just tastes like…tea, as it was mixed with oolong and green varieties and citrusy calamondin juice. 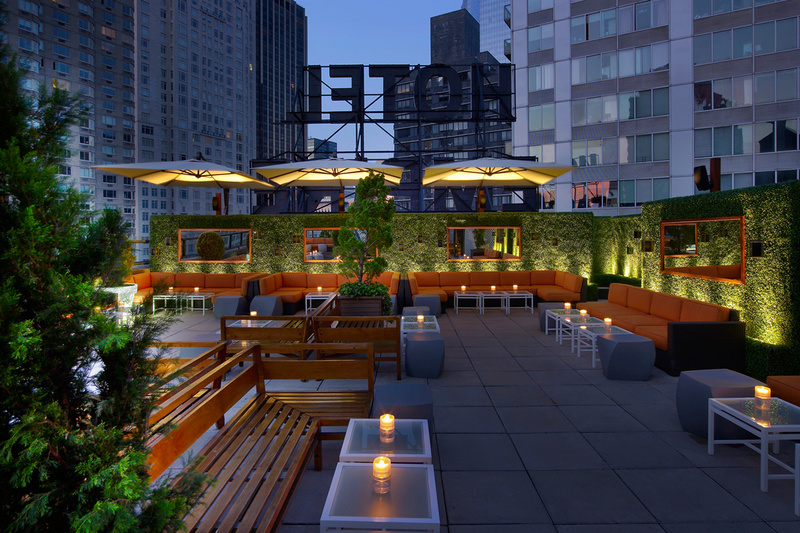 Most rooftop bars rely on their expansive vistas to woo the crowds, noting the sky-high vantage as the main attraction. 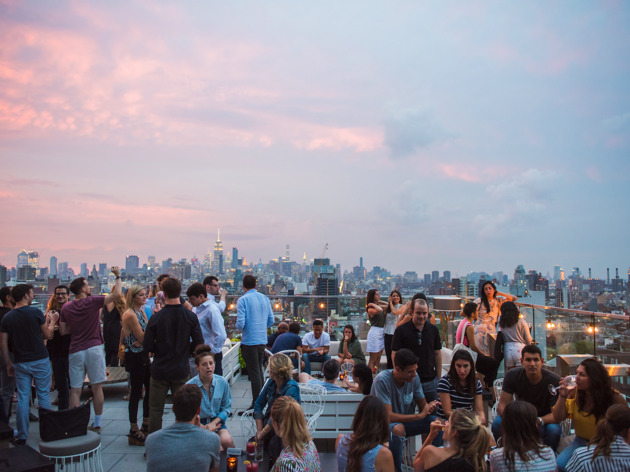 For Magic Hour, its view of midtown and the Empire State Building is just a footnote. The place plays up the idea of an “urban amusement park” in its palatial 10,000-square-foot space, with rotating carousel seating, a topiary garden and Foreplay, a putt-putt course filled with animal statues in NSFW positions. 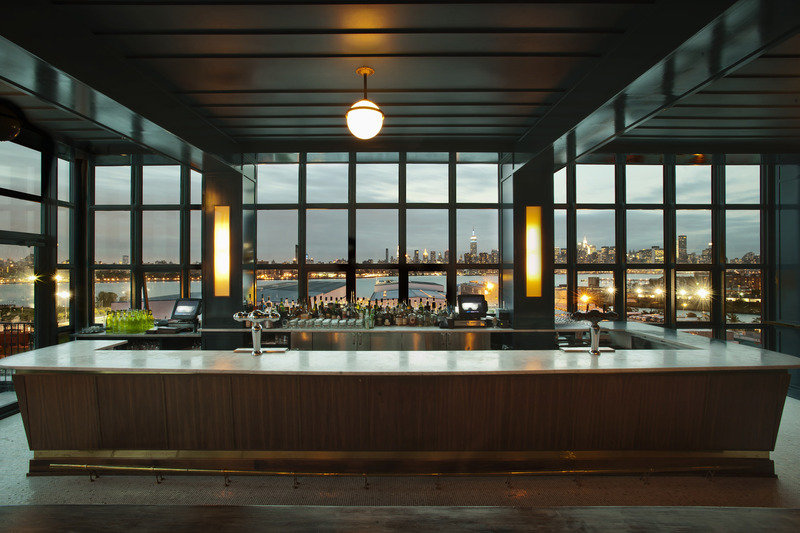 This outdoor terrace bar on the Wythe Hotel’s sixth floor affords sweeping views of the East River and Manhattan, and it’s an ideal vantage point for watching sunsets while lingering over a Professor Fritz Briem tall boy or a quaff made from local small-batch spirits. 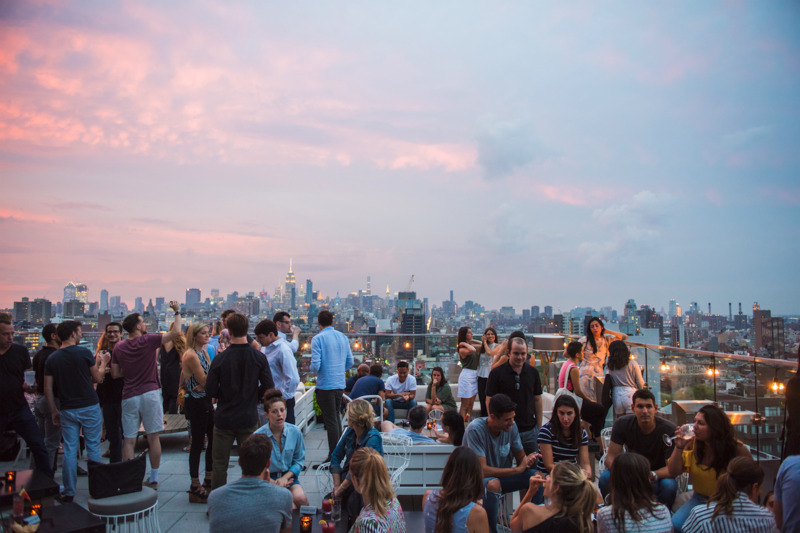 Sure, the crowd comprises mostly globe-trotting cool kids from outside the five boroughs, but consider that another avenue to finding a guilt-free fling. 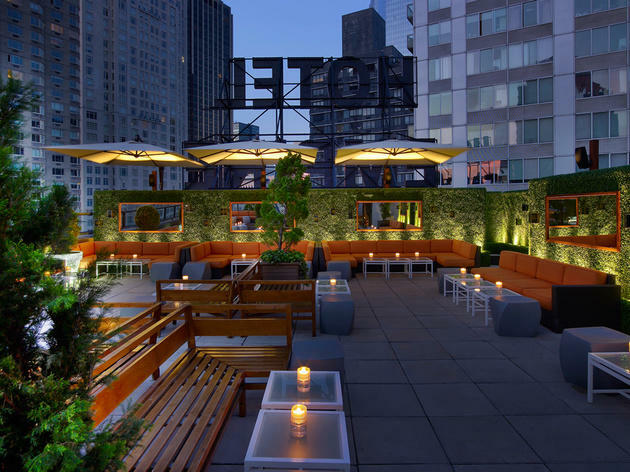 Part of the Hotel Indigo’s 26-floor expansion on the Lower East Side, this cocktail den sprawls across two outdoor terraces with a swimming pool and soaring views of the Manhattan skyline. 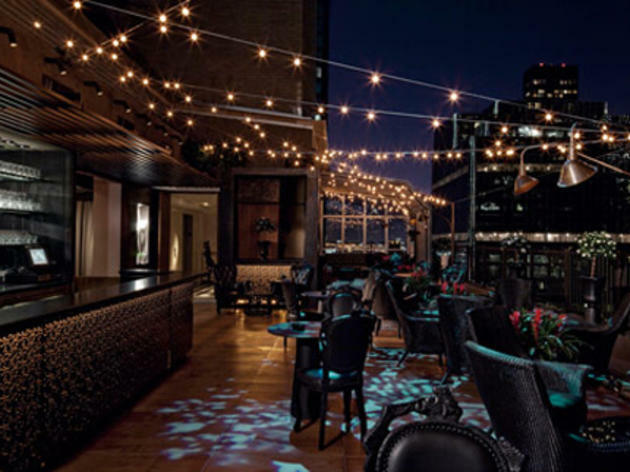 The loft-inspired lounge is decorated with exposed-brick walls, reclaimed-wood tables and free-hanging light fixtures inside, while a flowing canopy and strings lights deck the terraces. You can pretend you're a successful business tycoon as you stare from the top of the Empire Hotel at all the little people below before marveling at the amazing sunset. 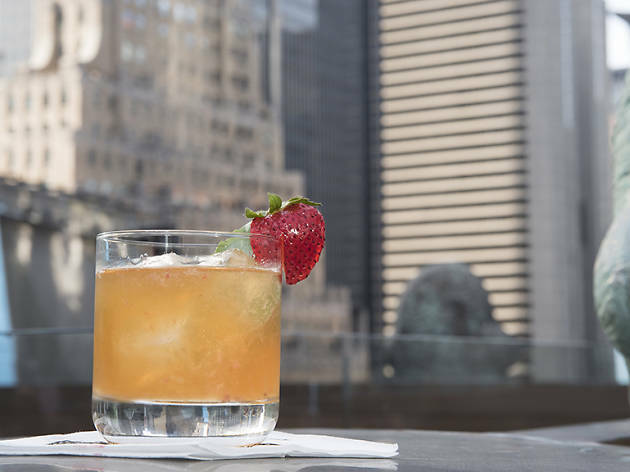 Three separate terraces offer views of Lincoln Center and Central Park, and an appropriately sleek bar—constructed of stacked metal pipes—dispenses specialty cocktails like the Oran’gin the Mood (orange juice, Bombay Sapphire, Patrón Citrónge and club soda). 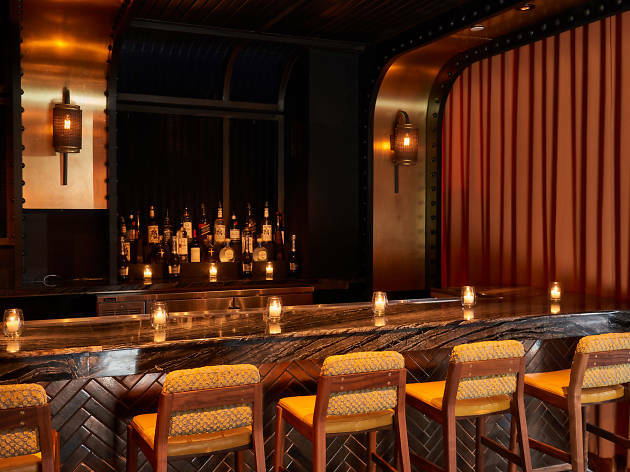 The team behind Dear Irving and Raines Law Room opened the second outpost of the former in midtown. 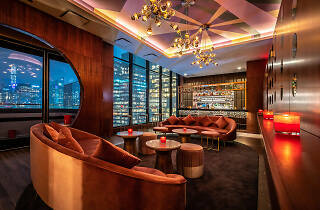 Dear Irving on Hudson is a bi-level cocktail bar that takes up the 40th and 41st floors of the Aliz Hotel in Times Square. While the bustling location is worlds away from the quiet block of Irving Place, the founders are sticking to some familiarities. 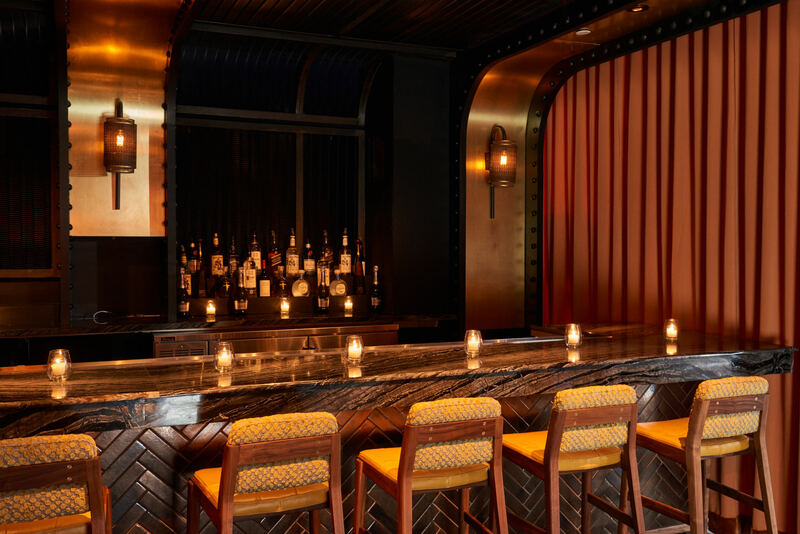 Most noticeably, a handful of cocktails and a "time travel" theme, with one floor akin to 1960s James Bond and another decked out in Art Deco finishes. 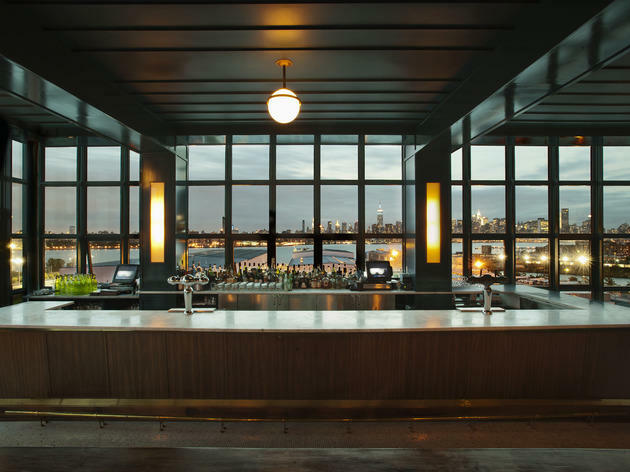 This newly opened rooftop is the tops in the Seaport District. 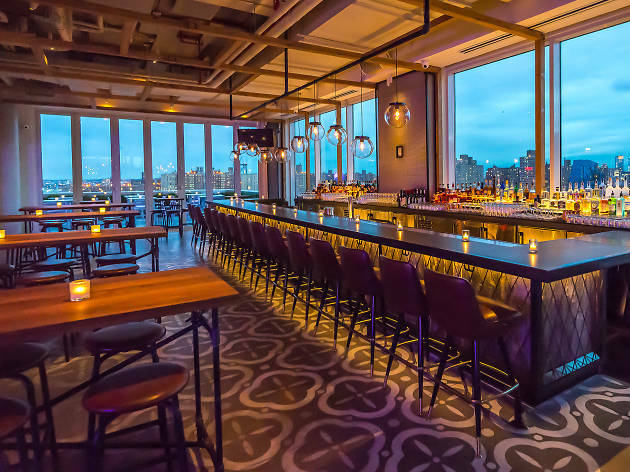 The chic, 60-seat space was designed by Rockwell Group (Nobu, W Hotels, EDITION, Moxy) and is outfitted with a blue and white marble bar, two fireplaces, candlelit tables and outdoor seating in the summer with views of lower Manhattan and Brooklyn. 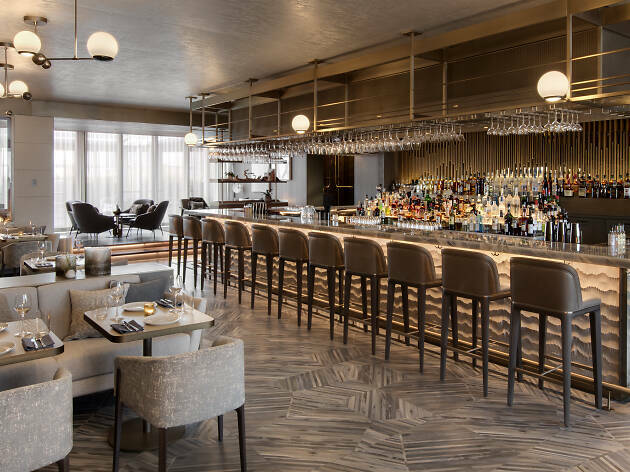 The team will serve craft cocktails and modern American small plates. 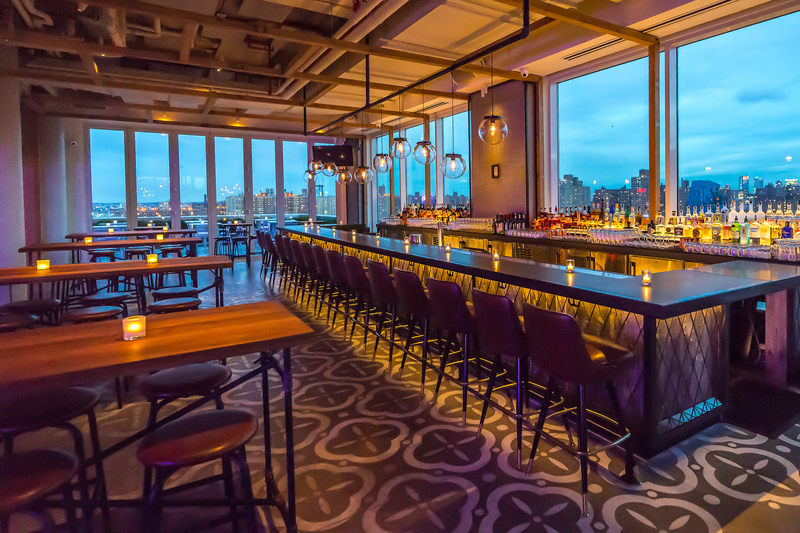 This rooftop bar, 17 stories above ground, offers a view of the East River and craft cocktails from bar manager Sam Anderson (Hotel Delmano, Freemans). 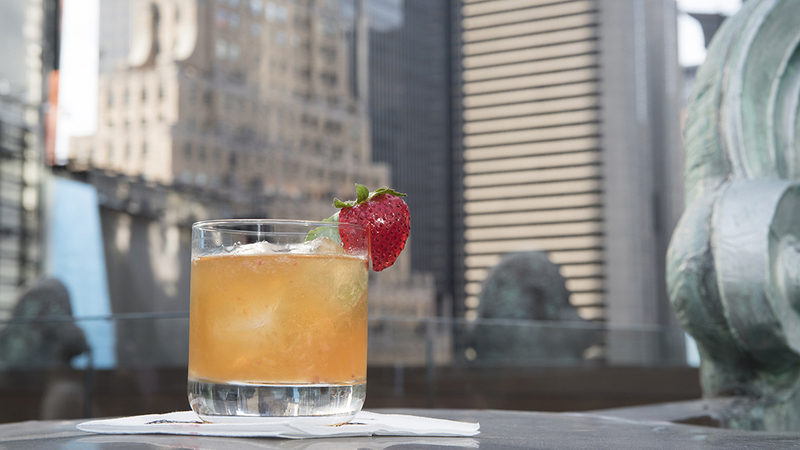 Sip the Weathervane, a mixture of rye whiskey, rosemary, ginger, Campari and lemon juice, while gazing at the vista. Chunky ottomans and couches draped in fur skins give this newcomer a cozy antidote to the Meatpacking District's gloss and sparkle. It's a place for you to giggle, fist-bump or just decompress and give the city's wintery headaches a dose of Aspen. 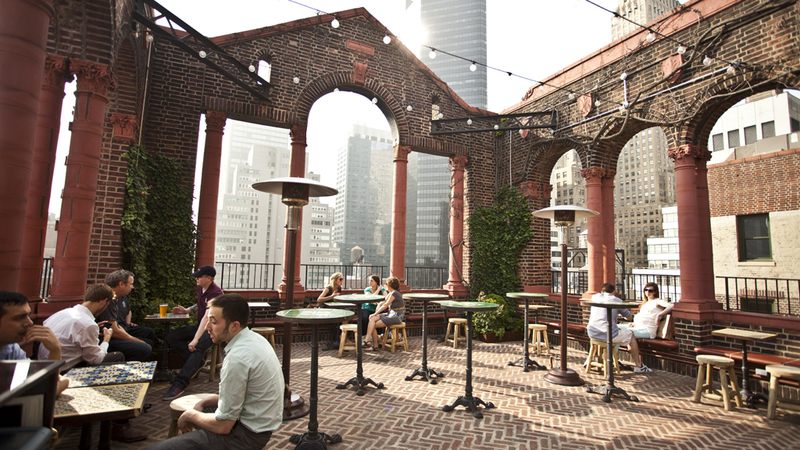 This rooftop lounge at the Kimberly Hotel offers views of the Chrysler Building. Sleek leather couches and wicker chairs decorate the airy space. 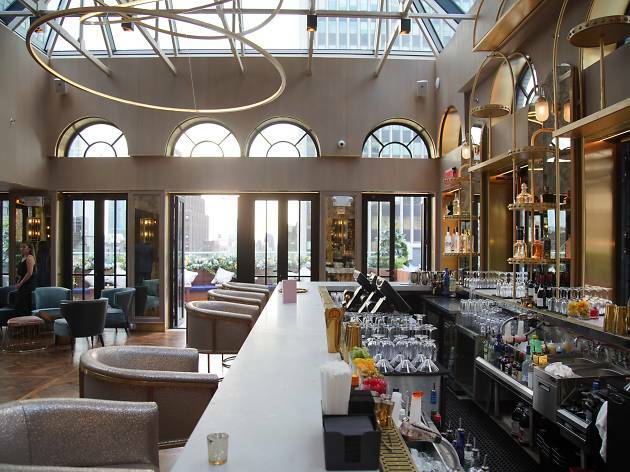 Choose from cocktails, like the Oh Yoko, and small plates, such as lobster sliders, salmon fritters and yellowfin tuna tartar. There are few better ways to enjoy New York than from above, cocktail in hand, gazing across the lights and landmarks that define the city. 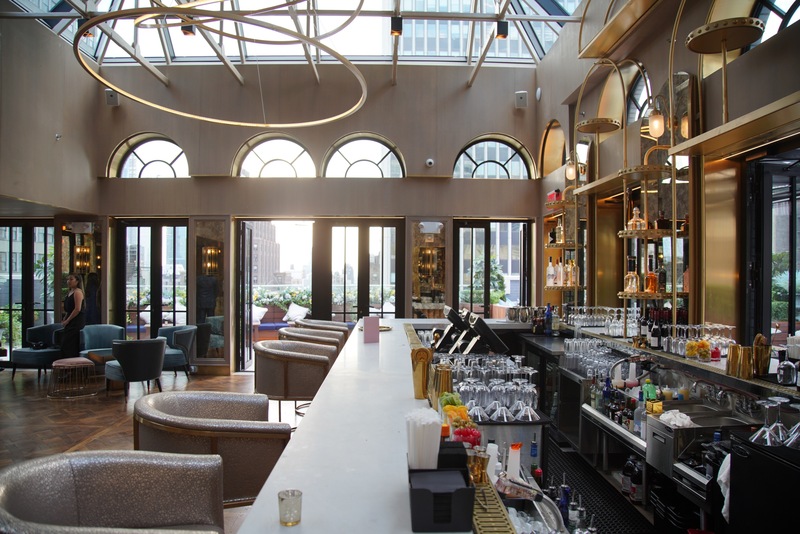 One such landmark is the historic Knickerbocker Hotel, onetime haunt of American elite like F. Scott Fitzgerald and John D. Rockefeller, which serves as base of this 7,800-square-foot rooftop bar and terrace. 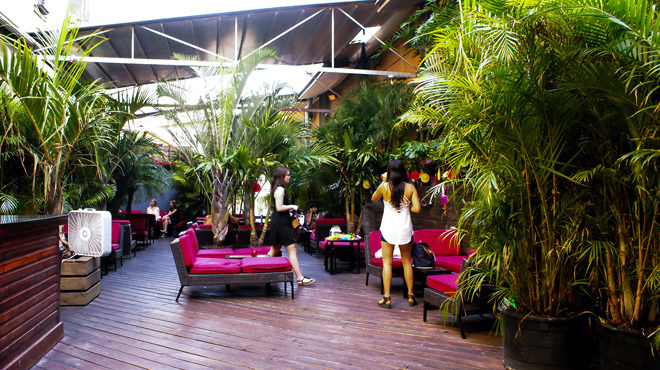 This LES rooftop offers a palm-studded oasis with white chaise lounges. On Saturdays between 10pm and 1am, the spot is often packed with large group reservations (fortune, it seems, favors the popular and organized). Head there on Sundays and Mondays for two-for-one well drinks. 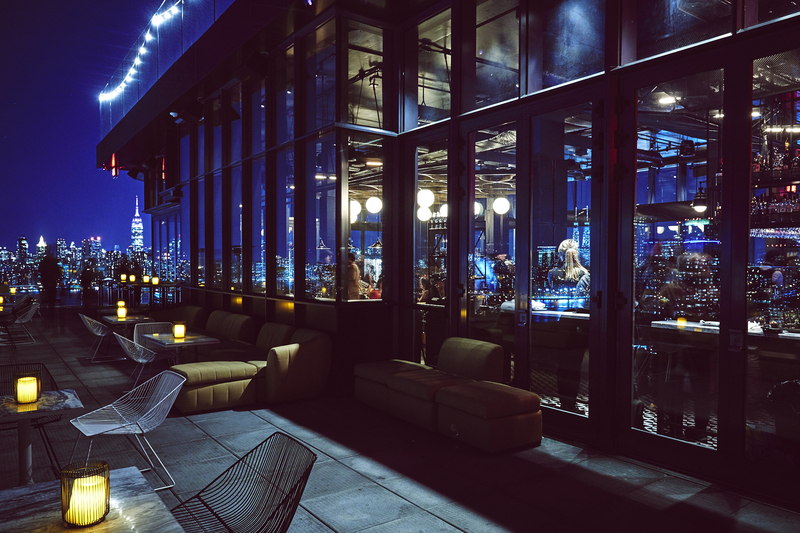 Getting past the doorman can be tough work at the rooftop bar of the still-trendy Standard Hotel, but your trials will be rewarded with stunning views of the Hudson River and downtown Manhattan. 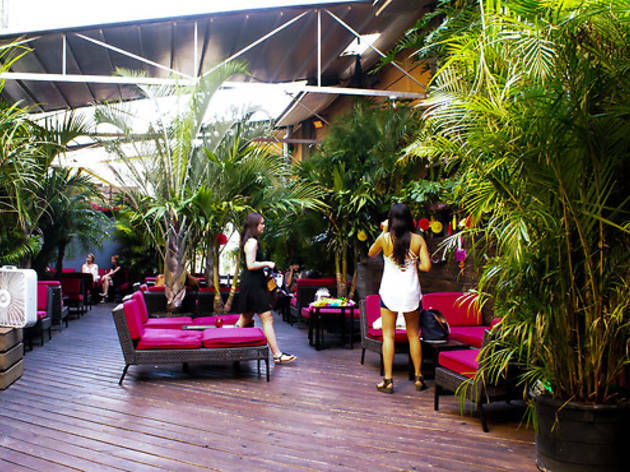 The bi-level boîte boasts an artificial-turfed alfresco bar with garden chairs. 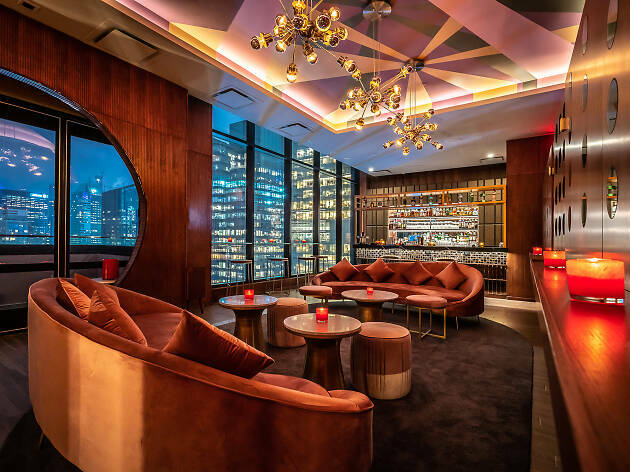 Don’t just bypass the lower-level room with floor-to-ceiling windows and a Jacuzzi—it hosts appropriately hip parties with top-notch DJs, like the weekly Nouveau York bash. 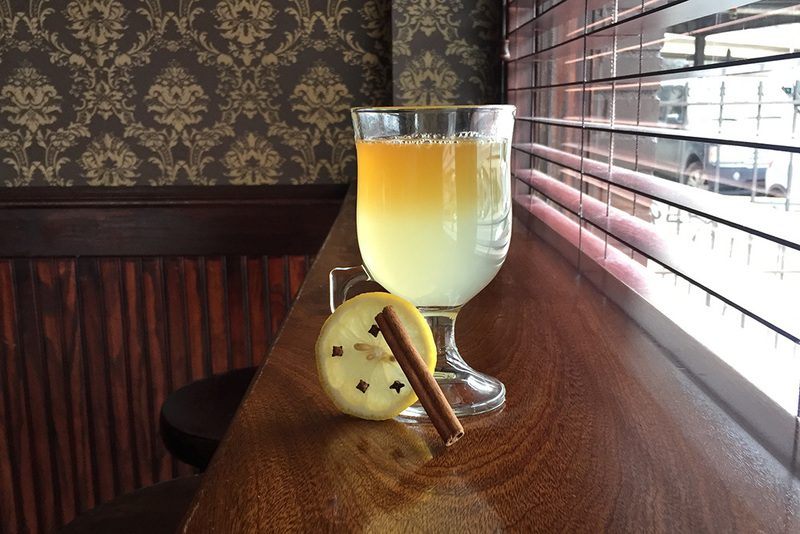 Looking for a drink to warm you up?